Sustainable sourcing of materials is one of the key element of our sustainability journey and it is pertinent to our performance and customer satisfaction. Under the umbrella of our environment conscious efforts, we strongly promote and develop materials that are not energy and water intensive and opt for materials that emit lesser GHGs. To promote sustainability in our products and operations, we are a signatory to Responsible Care initiative. Material sourcing and management is crucial in controlling costs and making our operations more reliable. We consider social and environmental parameters in procurement activities and supplier on boarding processes. We have identified “strategic raw materials” that comprises of top 50 raw materials procured by our company. We focus on the key drivers of price and supplies of these raw materials. Strategic sourcing has enabled us to have a disciplined and systematic approach towards optimising the total costs, timeliness of delivery and quality of externally purchased materials. Our supplier evaluation methodology comprises of a detailed audit with balanced scorecard which helps us to select the right supplier and measure their performance on a continuous basis to align with our sustainable procurement agenda. At UPL, we give preference to local suppliers wherever possible in order to respond promptly to the requirements, thereby simultaneously strengthening local economy. 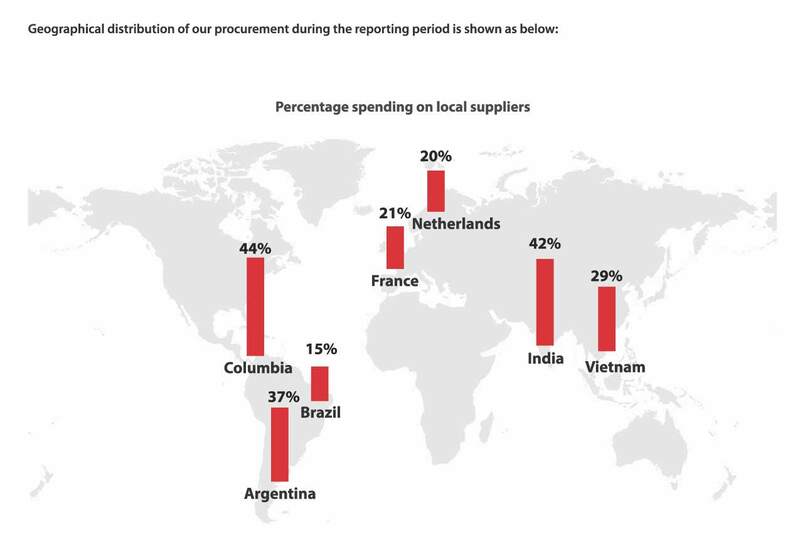 During the reporting period, 37% of our vendors were sourced locally (within respective country). One of the UPL belief is adopting upgraded and advanced technologies into their system which has a positive effect on the environment. To implement this belief of ours, we have an in-house team for inspecting, repairing, upgrading and replacing our worn out machines and evaluate and develop new technologies which would assist to make our operations more effective. By using the latest technology, we reduce overall impacts of our products. Some of them are Reduction in power consumption for refrigeration by 12% through reduced condensation temperature from 400c to 360c and process yield improvements in some key products for reduction in consumption of raw materials and also reduction in waste generation. After the operations are completed and we have our products ready, we make sure that there are minimum residues of the product. Most of our plants are devised to have “Zero Liquid Discharge”. 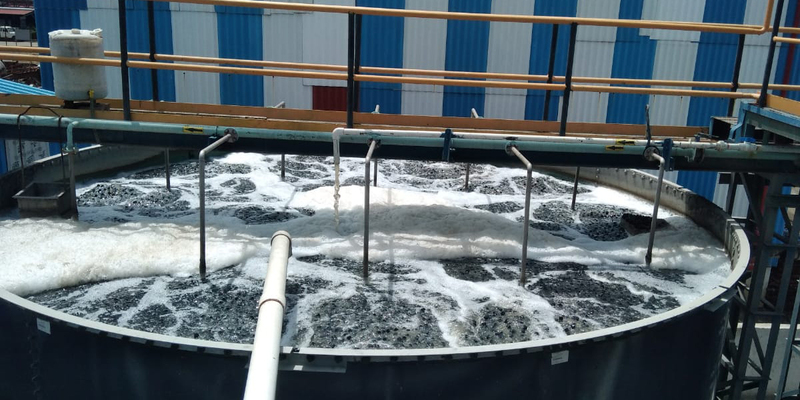 Some of our waste products are recycled by 100% like Ammonium chloride, Ammonium acetate, Methyl chloride, sodium sulfate, ammonium sulphate, calcium chloride, hydrochloric acid, MDC residue, HNO3, etc.Some are products are recovered above 95%. Other remaining wastes are treated and disposed safely as per the government norms and standards. We have also imbibed “The Green Procurement Program” ideology which helps us to incorporate the robust mechanism to procure raw materials and packing through a sustainable source. Most of our packaging material is procured by local vendors and suppliers around and nearby our plants. The materials which are used for packaging of our products are Plastic bottles, corrugated boxes, Fiber drums, Flexible laminates, HDPE Woven bags, etc. We also procure raw materials such as MnSO4, Salt, Caustic soda, Chlorine, Hydrated Lime, ZnSO4, 3-4 DCA, Specialized Starch, China clay, Mg turning, Ethanol, Sulphur, Ammonia, Chloral, Acids and etc. Suppliers and vendors who procure raw materials to us need to be in terms of goods and services. Also our global affiliates come under the purview of our Supplier Code of Conduct.